OK, so normally Explorer Beastie and I would be taking you to one of our favourite Dublin places today… But when a rare opportunity to visit Belfast presented itself, we could hardly say no! 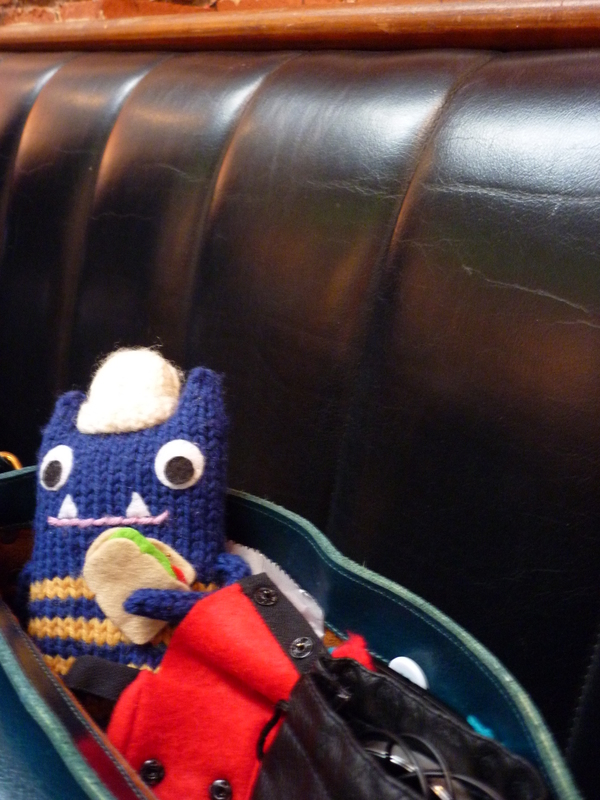 …Then we grabbed a quick bite to eat before heading into the museum! It turns out that there are lots of monster-like things living in the Ulster Museum, if you know where to look! These incredible sculptures are made from woven willow, and they’re the handiwork of local master basketweaver Bob Johnston. They’re so lifelike that you could almost imagine them swooping down from the ceiling! Fortunately, they seem more interested in each other… for now! This trip was a great opportunity for me to check in with some old favourites – the exhibits I’ve been coming here to see since I was a small, creepily-obsessed-with-Ancient-Egypt-and-vampires child. Even after a complete refurbishment a few years ago, many of them are still on display! That includes Takabuti, the Eygptian mummy who has been an important part of the museum’s collection since she was first introduced to the public in 1835. Since long experience has taught me that not everyone shares my enthusiasm for mummies, I’ll just include this photo of a lock of Takabuti’s hair here instead… but you can find out more about her on the Museum’s website if you like! …And some prehistoric creatures that are still with us! Explorer Beastie was pretty intriuged by this coelacanth – a fish that was thought to be extinct until a live one was captured off the coast of South Africa in 1938. Before this, it had only been seen in fossils – ones that were at least 80 million years old! The Ulster Museum’s own “living fossil” was caught in 1973 off the Comoros Islands, and has been here ever since. …And discovered the kind of treasure that would make Pirate Beastie’s one remaining knee go weak! Wait a second… Tomb? Shipwrecks? Mummies? This is all getting very morbid! I think it’s high time we headed off to find that Rembrandt! Wow. The detail in the face is amazing – you can almost imagine him opening his mouth and launching into his life story. In fact, this is one of the last paintings Rembrandt completed… a final addition to the collection of 80 or so self-portraits he produced in his lifetime. …And a quick hot chocolate on the way! Thanks for joining us on our adventure north of the border! We’ll be back in Beastie Towers next week, bringing you monster news on Tuesday and another Dublin day out on Friday. In the meantime, have a super weekend! Previous Post A Busy Beastie Month! Next Post Back to School at Beastie Towers! Morbid museums are the best. If you ever get to Montpellier, you have to visit the museum at the faculty of medicine there. Oh yeah! And now I have an excuse to go back to Montpellier… It’s been a while 😀 I also love Dublin’s Natural History museum and the bog bodies in our National Museum – did you see those when you were here? What a beautiful trip! Love the hot chocolate stop. Thanks! It’s always important to keep your strength up when you’re travelling 😉 Enjoy your weekend! Looks like a great museum – I bet there was lots of information that needed reading! That museum looks great. Thanks for sharing the highlights of your visit. Your photos always make me smile. Heehee! Thanks! The Ulster Museum is pretty small, but they do have some great stuff in there… Worth a visit if you ever find yourself back on this side of the pond 😀 Enjoy your weekend! That totem pole looks very much like a stack of Beasties. I think Explorer Beastie might have discovered hi ancient heritage! Let’s just hope he’s not from a cannibalistic tribe. Although I’m not sure how threatening those little felt teeth might be. Let’s just hope no primal urges suddenly take hold. I heard there was another native Irish species on display in the Ulster Museum…one of the tallest Irish Wolfhounds ever measured. Did Explorer Beastie encounter that one? Perfect transport for him, although he’d need a ladder to get up! When I saw the totem pole Explorer Beastie was admiring I began to wonder if you had an impulse to create a Beastie version ?? You could be on to something… Practical in winter, an intriguing “outsider art” piece to enjoy in summer. To the yarn shop!